Standing desks are all the hype now and Stand Steady is one of the larger players in the game. I’ve been using the Stand Steady X-Elite Pro Sit-Stand Desk for a little over a week now. At this point I think I have a good enough measure of the drawbacks and advantages of this desk to be able to give a quality review of the product. So below are my thoughts on the product along with pictures and video of the product. The X-Elite Pro is really a “plug-n-play” kind of table. You take it out of the box, put it on your desk, adjust it to your preferred height and you are ready to go. Less than 1 minutes of work. No assembly required. To lower or raise the desk, all you need to do is grab the lever on the left that activates the hydraulic system. No need for any wires or plugging in anything. It couldn’t be any easier. Raising the desk will only require one hand—just use your left hand to press on the lever and pull up. However, going down, you are going to need to have your left hand on the lever and use your right hand to push down. You don’t need to be forceful, but you will need to push. But whether it’s going up or down, it’s a very smooth process and at no point does it feel clunky or stuck. The unit itself weighs 27 pounds so it’s not hard to get out of the box and set onto your existing desk by yourself. As far as how much weight the desk holds, the manual says it will hold up to 20 pounds. That means having two monitors and your keyboard, mouse, and phone on it will not be a problem. For me, I use it with my laptop and my 22” Dell monitor. If you have anything large you want on your desk, like a large television or multiple large flower pots, I suggest you set that on top of your existing desk (the one the X-Elite Pro sits on). Remember, this desk is only suppose to hold 20 pounds, which is more than enough if you are just working. 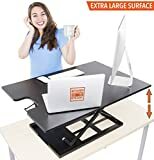 If you want a standing desk that that holds more weight, you might want to invest in a full sit-stand desk, which can run you about $300-$600 more depending on the brand. The same brand that sells the X-Elite Pro also produces a full sit-stand desk you can get here. I love the sleek black look. The desk is made of laminated particleboard and the hydraulic legs are made of steel. I haven’t had it long enough to know if the black will wear of easily or not but so far it hasn’t. Remember, there’s another 2.5 inches at the base so that’s really 10.5 inches that’s raised on top of your desk. So the desk is 28 inches wide and 20 inches in length. I have no problem putting my laptop and a 22 inch monitor on it. If you want to put two monitors on it instead one laptop and one monitor, you could do so by placing the monitors on the corners. I like the monitors better that way anyway. If you are going to use the two full monitors setup, you still have plenty of room left over for your keyboard, mouse, phone, and other office equipment.As you can see from the above picture, there is plenty of room when I use an extra monitor in conjunction with my laptop. At 28 inches, it could be a little wider. However, I know with the material that this desk is made out of, having it be wider/bigger will make the desk much heavier. So I can relate to that. After a week of using it, I absolutely love this desk. I think it is well worth it at this price. If I didn’t already have a full sit-stand desk, the X-Elite Pro is definitely one of my top choices to purchase. So if you fit in the above category and are interested in getting a standing desk, this is a very good choice. This product usually sells for $350 but you can get it for $290 right now. If you have any questions about the product, let me know in the comments below! PS: But before you decide to buy, I want to let you know that although my review is unbiased, I do get affiliate commission if you decide to buy from my link.